One of the most frequently voiced complaints on the publication of Napoleonic era books is the lack of primary source material in English from countries other than France and Great Britain. In the past 25 years, there have been at least 75 British memoirs published in English, many French memoirs, yet only a handful from all the other countries, which fought for and against Napoleon. This is understandable, when one considers the cost associated with having them translated into English. 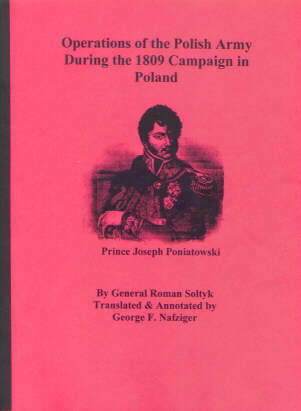 Dr. Nafziger continues this initiative with his latest publication, General Roman Soltyk’s Operations of the Polish Army during the 1809 Campaign in Poland. This book, written by a Polish officer who served in one of the two Polish horse artillery batteries in 1809, was first published in 1841 in French. Dr. Nafziger translated it into English for the first time, annotating the text for clarity when necessary. The bulk of Operations covers the Austrian invasion of the Duchy of Warsaw and the Polish response to it. Soltyk begins with a study of the state of the Polish Army at the beginning of 1809 and provides a comprehensive order-of-battle for it. Throughout the book, he shows the various expansions the army went through during the campaign. Included in these orders-of-battle are unit organization and strengths, areas they were recruited from, where the unit is located at a particular time, their commanders and staff. This information is not just for the combat units, but also for the support units. (A piece of trivia: the Polish pontoon company consisted of only eight men at the beginning of 1809.) This in itself makes the price of the book a steal! Yet the author does not stop there. He also provides a detailed order-of-battle for the Austrian forces, down to the number of battalions and squadrons in each regiment, types of artillery pieces, etc. Roman Soltyk’s descriptions of the campaign and battles are masterful. He begins with the strategic overview for that portion of the campaign that will lead up to the battle or skirmish. These overviews include the political machinations by all parties (not just the Poles and the Austrians, but at times the Saxons, the French, and the Russians) involved, a military description of the terrain, the forces on all sides (sometimes there were three sides -- for the Russians, despite their publicly stated support for the French, often had their own agenda), the different armies’ objectives, and their campaign plans. Soltyk’s accounts of the battles are vivid and easy to follow. My only complaint with the book is that the author did not provide maps of the battles – a minor point because of the clarity of the text. In addition to all of this, Soltyk also provides short biographies of some of the more notable Polish commanders, including Dombrowski, Zaionczek, Sokolnicki, Fiszer, and Pelletier. Interspersed throughout the narrative are descriptions of the various fortresses in Poland, with information on the state of their defenses, the size of the walls, and make-up of their garrisons. Soltyk closes with 21 appendices which are copies of correspondence and reports from Poniatowski to Napoleon, Marshal Berthier, and Marshal Davout; the surrender terms for the Polish garrison in Sandomir; correspondence between Poniatowski and the Austrians over the capitulation of Cracow; a copy of the final armistice between the Poles and the Austrians; and lists of soldiers who distinguished themselves in the various battles of the campaigns. Dr. Nafziger has done a superb job translating Operations from the French and making obscure references and military terms understandable to the modern reader. His annotations do much to bring the events described in the text into context of the overall military situation in Europe. Operations of the Polish Army during the 1809 Campaign in Poland is essential for anyone interested in either the Polish Army or the 1809 Campaign or both! Hopefully, George Nafziger will continue to publish these very informative memoirs.